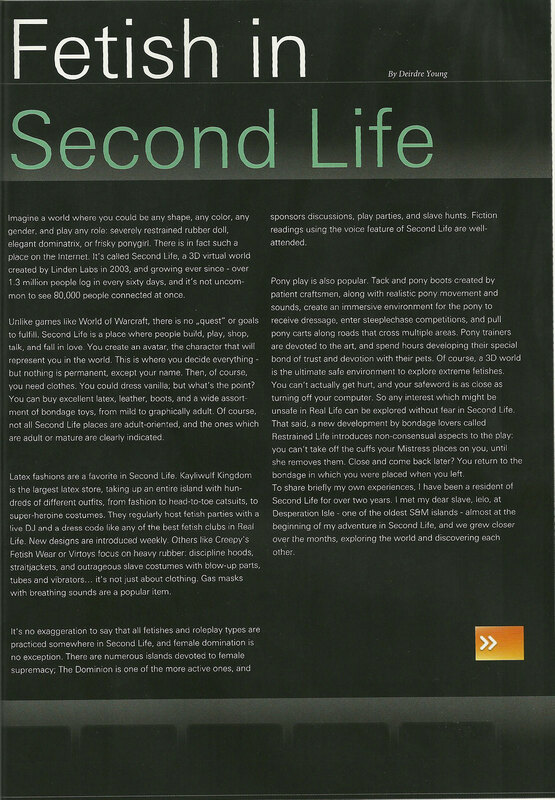 Last October, we were visiting my friend Elly Dagger, sitting on her gorgeous pier and looking at the sea, and out of the blue, she says "Some magazines write about SL.. have you thought about getting published?" I was struck dumb. No, I hadn't. Like, ever. We do a blog, we have fun in Second Life.. wow. What a thought. I called a friend who knows the fetish magazine biz, and he suggested Marquis. I sent Marquis a letter of enquiry, got a friendly and encouraging reply, then sat with lelo to start writing. We tried to pick spectacular and representative places and outfits, and wondered how to get them in good enough quality for print. We got the article done, sent it in under deadline, and boom, we got published. I'm still a bit stunned, honestly. So, here we are, some months later, with an advance copy of Marquis issue 47. Second, here's a peek at our article. See if you can spot the places and outfit designers.